I had read some great reviews on William H. Weber's series of books entitled 'Last Stand'. Typically, I'm going to keep this site entrenched in 70s, 80s and 90s, but occasionally I will peek at newer novels that fit in the same mold. 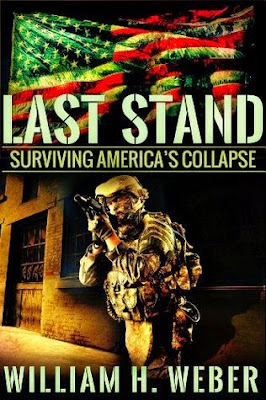 I just finished up the first book in the series, simply titled "Last Stand: Surviving America's Collapse", and was really amazed at the level of talent from this author. This is Weber's first novel and was self-published in 2014 using Amazon. From the vivid details of battle to the technical aspects of shooting and survival, one has to conclude that Weber has had some sort of SHTF experiences in his life. It is hard to find gritty realism in the action genre and "Last Stand" absolutely stands out as a winner. The book is set in the present (modern) day and shows us a nightmare scenario of an EMP bomb exploding over Kansas City and knocking out anything with a microchip throughout the US. Bye bye cars, cell phones, electricity and Gameboys. Unless the video game consoles are fully charged...then maybe 3 to 4 hours of game time could be rationed for weeks of Mario. But other than that...goner kids. Our main character, John Mack (typical bravado in the name), is a longtime prepper for SHTF and is absolutely stacked for the coming doom. The author describes technical jargon of survival and prepping in a fairly informative and elementary fashion. John Mack's skill set as an ex-military guy obviously has a great deal to do with the Mack family surviving this ordeal, but prepping 101 is imperative. Mack is equipped with a 1978 Chevy Blazer, 2 Ruger SR-22 handguns, a S&W .40 handgun, a Kel-Tec shotgun and his handy Colt AR. Beyond the obvious firepower, Mack's home is already designed for invasion and his family makes quick preparations of fortifying windows and doors with razor wire and nail boards (like 'Death Wish 2'). Food isn't a real issue for them with stockpiles of essentials and water. Beyond that, the family already has a bug-out - a fully stocked cabin in the Tennessee forest. Against Mack's better judgement, he agrees to stay in their suburban neighborhood and teach the neighbors how to survive. About four days into the training, a local gang leader assaults the neighborhood leading Mack and the neighbors into a full-scale war to protect their homes. A bulk of the story is dedicated to explaining shooting tactics, prepper 101, traps and a few other things ultimately affected by something like solar flares or an EMP. As a prepper myself, I found this book exciting, somewhat educational and a bonafide must read for anyone looking at a possible SHTF scenario some day. I might encourage friends and family to check it out too. The book is followed by three sequels - "Patriots", "Warlords" and "Turning the Tide". There are numerous other books like this, sort of wrapped in a conventional sub-genre called Prepper Fiction.